The Saints were never covering during their NFC Divisional Round Matchup with the Eagles, but they had a chance to pull it out later. Our betting recap. The New Orleans Saints are moving on to the NFC Championship Game against the Los Angeles Rams next week after defeating the Philadelphia Eagles 20-14 on Sunday in the NFC Divisonal Round. However, it was a disappointing performance for Saints bettors. The Saints closed as 8.5-point favorites after a late run of action on New Orleans just before kickoff. But after the Eagles jumped out to a 14-0 lead, the Saints had to play catch up the rest of the game and they didn't spend a single second covering as home favorites. __Play to win:__ [Enter our free contests for a chance to win a BetChicago prize pack! ](https://betchicago.chalkline.com/) They did have one chance late to both seal the game and provide their betting supporters with a chance to cash. As for the total, it closed at 52.5, and the UNDER was never in serious jeopardy as both defenses turned in strong performances on Sunday. So let's take a look back at all the action that had a betting impact in Sunday's divisonal contest in our divisional round betting recap. ## Saints-Eagles betting recap Saints bettors knew they'd be in for a long day from the get-go, as Drew Brees underthrew Ted Ginn Jr. on what could have been a touchdown on the first play from scrimmage. 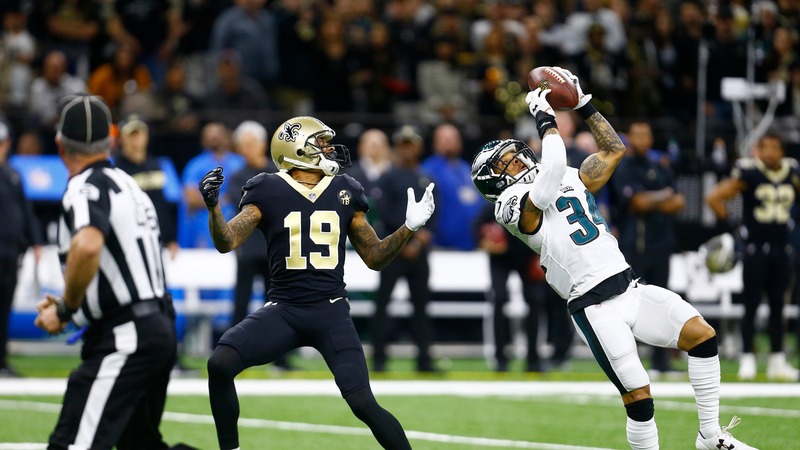 Eagles cornerback Cre'Von LeBlanc would actually wind up coming down with the floater over the middle, and the stage was set for a long day for anyone holding a Saints ticket. <a href="https://twitter.com/SBRSportsPicks/status/1084567033260453889" class="embedly-card" data-card-width="100%" data-card-controls="0">Embedded content: https://twitter.com/SBRSportsPicks/status/1084567033260453889</a> The Eagles would proceed to march 76 yards on seven plays, taking a 7-0 lead on a 37-yard touchdown pass from Nick Foles to Jordan Matthews where Saints cornerback P.J. Williams got turned around. The Saints would go three-and-out on their next drive, and the Eagles went on another methodical touchdown drive to take a 14-0 lead late in the first quarter. Eventually, a Marshon Lattimore interception would help the Saints settle down, and a long Saints touchdown drive in the second quarter would help steady the home side. From there, the Saints would slowly make the plays needed on both sides of the ball to continue crawling back into the game before finally taking the lead late in the third quarter after an impressive 11:29 drive that covered 92 yards on 18 plays. __More:__ [Patriots-Charger betting recap](https://www.betchicago.com/chargers-patriots-afc-divisional-round-betting-recap) At that point, the Saints had all the momentum and it looked like Saints backers were alive again with just over 17 minutes to play and the Saints holding a 17-14 lead. However, the Eagles defense proved to be just pesky enough to thwart New Orleans' efforts to put them away. They held the Saints to a field goal that made it 20-14 on their next offensive possession. Then on the possession after that, Michael Bennett blew up a third-down rushing attempt designed to preserve a Will Lutz field goal that would have made it a two-possession game and put Saints backers into a covering position. However, rather than gaining a few yards to set up a field goal attempt from around 45 yards, the Saints lost three yards thanks to Bennett. That turned Lutz's attempt into a 52-yarder. <a href="https://twitter.com/DLineVids/status/1084622328569327617" class="embedly-card" data-card-width="100%" data-card-controls="0">Embedded content: https://twitter.com/DLineVids/status/1084622328569327617</a> Lutz would miss the kick, keeping the lead at 20-14. And after the Saints intercepted a pass to end a last-ditch attempt for the Eagles to pull off the outright upset, they gained the one first down they needed to seal the game easily and ran out the clock to preserve the Eagles cover. The Saints will now have a rematch against the Rams in the NFC Championship Game. They won their first meeting 45-35 and they're listed as [3.5-point favorites](https://www.betchicago.com/2019-nfl-conference-championship-game-odds-trends) in the second meeting, according to Westgate.